As I write this I am dreaming of the true spring days that I know and love; the ones when the sky is a bright blue with white wisps of clouds, the air is fresh but the sun is warm and some days come along when you feel safe to wear short sleeves outdoors. Sadly they have been few and far between but I live in hope that the month or so we have left of this season will bring some sun and I’ll be able to pack away my winter woollies. 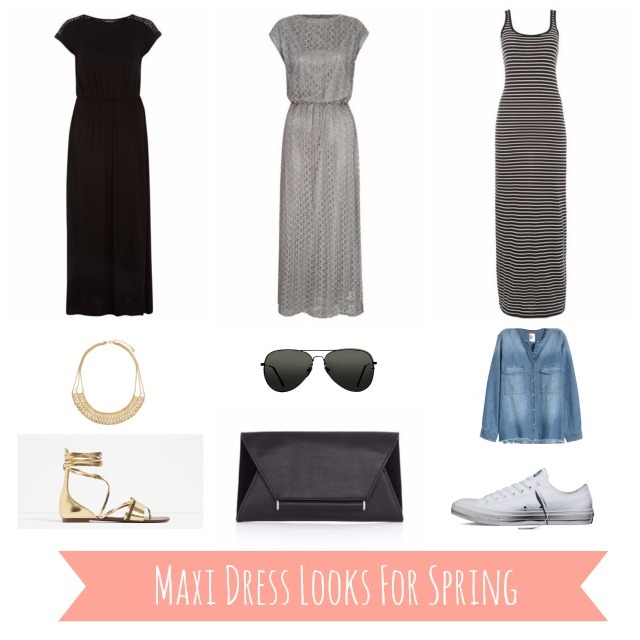 Whilst I’m still dreaming of these spring days I’ve put together three of my favourite maxi dresses and accessories. A good maxi dress is usually a staple of my summer wardrobe. I’m still attempting to think in terms of ‘capsule wardrobe when I buy new clothes so I’m always looking for things that are versatile and I think a maxi dress falls into that category. Perfect to wear when you aren’t quite ready to get your pasty winter legs out for all to see and easily kept casual or dressed up. I like that the maxi dress keeps you cool, they’re comfortable whilst covering you up and the styles that pull in at the waist are always high on my wishlist! I may already have a black maxi dress but there is always room for one more! I can’t help it, even in summer I like my dark clothes and I can never resist one more black dress. I love the cute cap sleeves on this and the lace detail on the shoulders. It could easily be dressed up or down, I would wear it on the school run just as easily as I would for a rare night out with the husband. I love the shape and colour of this Mela Love London Maxi Dress and I imagine it would be very flattering to wear. I’ve just teamed it with some classic aviators and a black clutch but there is so much you could do with it. Another one I like because it covers the shoulders and pulls in the waist, I always find them so comfortable to wear. I couldn’t resist going for a stripe, another favourite in my wardrobe, and this Vero Moda one is a definite bargain. That means I could afford to splurge a little on yet another pair of Converse trainers to go with it, a girl can never have too many. This would be a great everyday dress for when the warmer days are here and doesn’t look too tight whilst keeping it’s shape. What do you always look to buy when the warmer weather comes round? I’m hoping the warm weather comes along to match these lovely summer clothes.